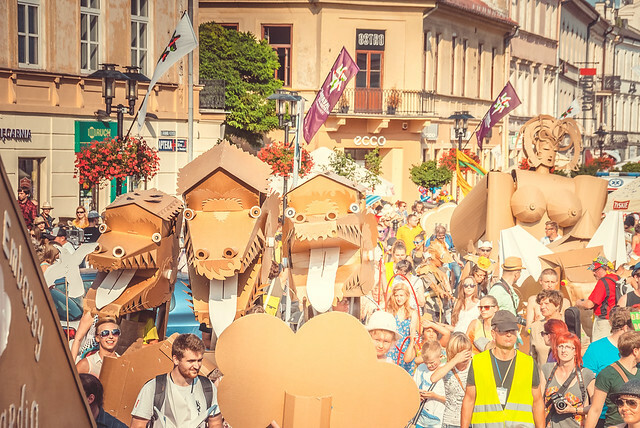 From 16 to 22 July 2018, Personages of Cardboardia gather at Kudykina Gora to open a laboratory for the researching the carnival traditions of Europe and Russia. What can be the basis of the customs of different cultures? How did the images of carnival heroes, familiar to everyone, arise? Why do they sooner or later unite all the peoples on Earth? We are trying to find the answers to these questions and invite everyone, who is willing to help us in our research, at the on-site internship workshop "Made in Cardboardia". For one day the park will turn into a united carnival space filled with music, parades, workshops, dance flash mobs, contests, theatrical productions and performances. Module curator: Olesya Kandalintseva (Minister of Education of Cardboardia) and Mikhail Gorshkov (Persdoange of Cardboardia and art-director of the “New school”) we will research some basic skills of working with cardboard, developing the concept of objects and set design. Together we will learn how to plan an event and create an event scenario based on a proposed concept. We will acquire public speaking skills and develop way of communication with an audience. Check in - July 16 (Monday), check out - July 22 (Sunday) the second half of the day or July 23 (Monday). The internship includes the process of preparation and participation in the festival from July 16 to 22, without days off. The daily schedule will be updated. The recruitment is based on the results of the test assignment and interview. For nonresident interviews can be remotely, online. TRAVEL. It around 3-4 hours drive from Moscow (Russia). We will help to plan and organize transfer from Moscow if you will come. The travel is paid by trainees independently. Accommodation in the park is possible in the camping (tent camp), free of charge. The number of places in the tents is limited, but you can set your own tent. Meals, breakfast, lunch and dinner are paid - 600 rubles. per day, in the cafe / canteen of the Natural Park of Wonders "Kudykina Gora". The menu is negotiated in advance. Module 1 - "Performance design: costumes, props and objects for interactive performances"
We invite to participate: beginning artists, designers, architects, photographers, students and everyone who is interested in making art. 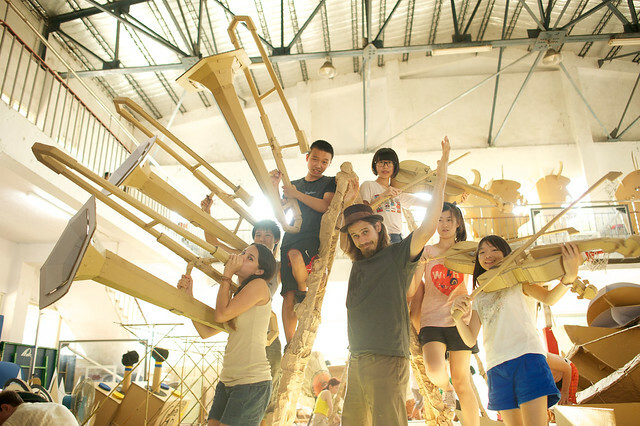 Take part in our intensive practical course - which will teach you the basics of cardboard-modelling and making performances with people. The course is ideal as a practice internship for students. Module 2 - "Street performance, organization and communication with public for beginners"
Suitable for actors, performers, directors, clowns as well as event managers/producers who would like both get a new interesting experience of creating performance from the very beginning and improvisation and take part in the organization of the process. Organizers who would like to develop skills interacting with the public in the process of street and spectacle performance are welcome to apply. Your training in performance and management is considered but not critical in our selection. This is an opportunity to take part in creating real projects where you will deliver unexpected tasks with delightful consequences. The way you are involved in participation depends on your desires, talents and diligence. For the experienced specialists the internship can become a base for experiments, public realization of art plans, research for new directions. For the students and beginners the internship can become an opportunity to make first steps and a place where you will be evaluated by your results, not your diploma and portfolio. - arrive to place of internship according confirmed schedule. 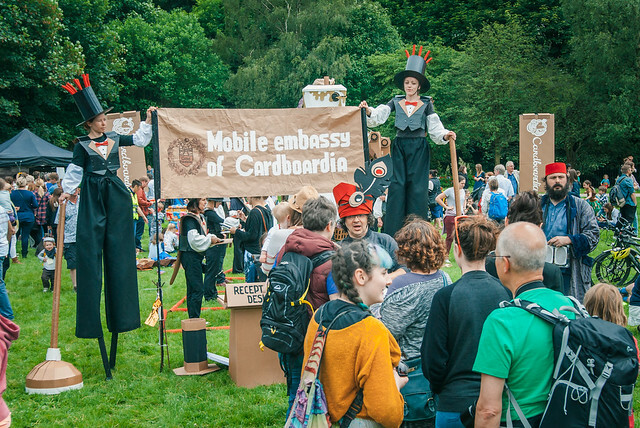 From 26 to 29 June we will setup Mobile Cardboardia Embassy in Slough to present culture of Cardboardia on 30 June for the Streets Alive 2018 Festival. Imagine if you could build your ideal world. What would you make? What would it look like? What characters and people would you see? Who would you be? And where would you be? Cardboardia is a country without territory, but with own traditions, rules, economic and political systems. Personages (citizens) of Cardboardia materialised thier country around the globe. We build towns, setup Embassys and celebrate national hollidays on territory's of friendly countries - Russia, Latvia, Poland, Taiwan, Germany, Finland, Slovenia, Denmark, Netherlands, Hungary and UK. Whether you’re an artist, a builder, a performer or a policeman, we’d like to invite you to join us on Slough’s High Street to meet and join the Citizens or Personages of Cardboardia! 1. Join us for a 2 hour public workshop on Wednesday 27 and Thursday 28 from 6pm - 8pm. Email info@homeslough.org.uk to get involved. For everyone aged 14+. Just 20 places. 2. Join us on the day for a workshop - and participate and play in our Official Cardboardia Orchestra on Saturday 30 June 10am - 6pm, info@homeslough.org.uk to say you’re coming. All ages. 3. Apply to join the Cardboardia Internships and learn new skills from Tuesday 26 - Friday 29 June 11am - 7pm, and on Saturday 30 June 10am - 6pm. Readmore below and sign up online. Ages 18+. Here is open call for everyone who wishes to take part in “Made in Cardboardia” workshop programme 16-24 June in the framework of the XXIV International Festival of Street Theatres in Arkhangelsk (Russia). From 16 June we will developing Official Cardboardia Orchestra show to present together on the International Festival of Street Theatres that will be held this year in Arkhangelsk from 19 to 23 June. The festival opens with a carnival procession along the Northern Dvina. Each day the city will turn into one big open-air scene. Illusionists, swindlers, magicians, clowns will coexist with musicians from Spain, drummers from Colombia and street theaters. we will research some basic skills of working with cardboard, developing the concept of objects and set design. WHEN: 16-24 June 2018 from 11am to 8pm. If you want to get and give a lot from this time, we count on your participation and full engagement in workshop and event process. But if you have any circumstances for this dates, feel free to indicate it in advance and we will take it into consideration individually. The internship lasts from 16 to 23 June,including the process of preparation and participation in the festival, without days off. We are expecting your full engagement at work for the whole period of the workshop. Participation is free. Participants are responsible for their own food and travel costs (include visas if needed) to place of internship. The project schedule will be specified during the online interview. According to the results of internship our participants get a chance to become part or full-time members of "Made in Cardboardia team"- in UK, Europe or Russia. Ten years ago Sergey Korsakov and his fiancée Viktoria didn’t want to have an ordinary wedding and decided to build a cardboard wedding palace during the Afisha Picnic Festival n Moscow where couples could make public acts of marriage. Sergey remembers: All of the guests liked this ceremony so much that I had the thought of building a second, bigger and longer existing cardboard town with its own traditions, institutes and economy. We materialized this idea in Moscow in January, 2008 to great public and press acclaim. Cardboardia is a country without territory. It was founded 10 years ago and we're celebrating our tenth anniversary this year! Our state is independent and not connected with any natural resources, just people's creative energy! We are always searching for new creative energy supplies in humanoid form! This year in Cardboardia’s laboratories we are research sounds a lot. It connected to our invention Alchemical Music Box (www.ambox.me). To celebrate Cardboardia 10th Anniversary much more loud Personages of Cardboardia decide to create Official Cardboardia Orchestra! The Tyran, elected leader of the country, put forward his candidacy to direct this process! 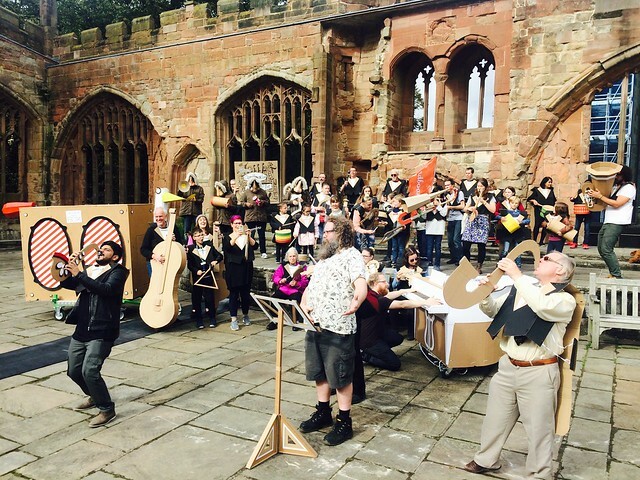 During 4 days in Coventry workshop our task is to create the strangest and most beautiful Orchestra in a world and we will present it on 30 September on Festival of Imagineers! See the final walk-about in Coventry University Square 1.45pm and 3.30pm Saturday 30 September.